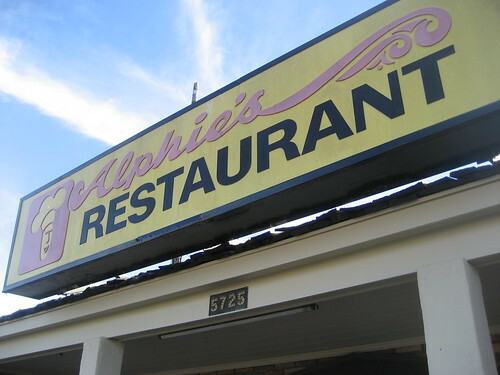 Even though I went to college just a few miles away from Alphie’s, I must admit I’d never heard of this restaurant until I read James Teitelbaum’s guide Tiki Road Trip. This family-run diner in Goleta, about a 15-minute drive north of Santa Barbara, has been around for decades (since 1957). 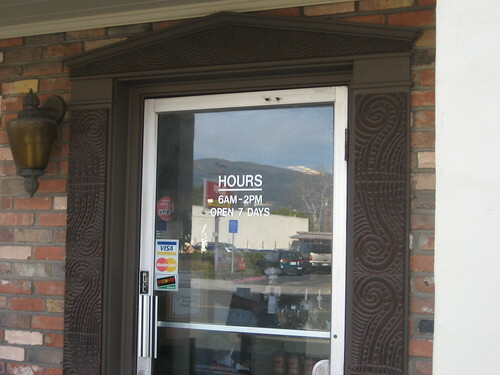 It has a bit of a Polynesian look to it, starting with these Maori-style carvings around the door and surrounding the support beams inside. 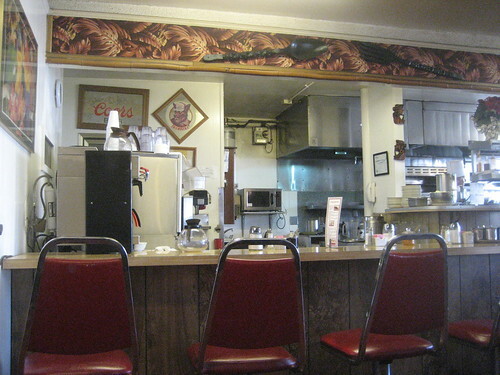 On the right when you first walk in there’s a counter that looks into the kitchen (note the giant tiki fork and spoon mounted on the wallpaper border). Maroon vinyl booths run the length of the dining room and there are also some round tables. 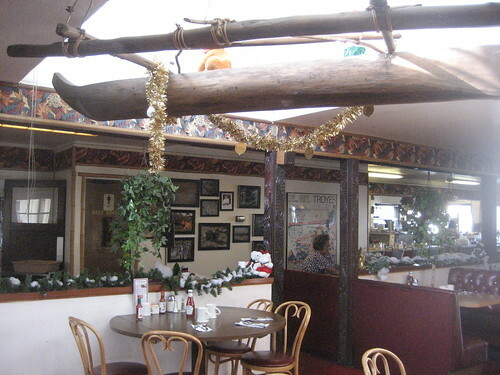 In the back there’s another dining room with a large outrigger overhead and a live music setup. Apparently the owner plays a mean jazz organ. 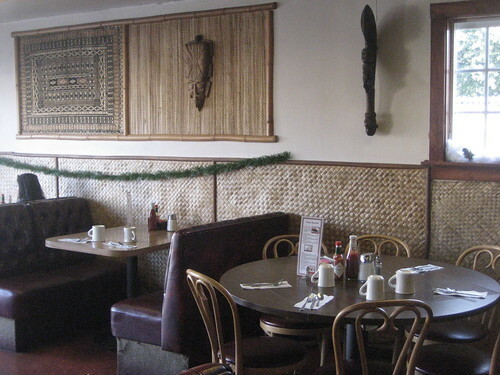 The walls are white, but most of them are half covered in lauhala matting trimmed with bamboo. 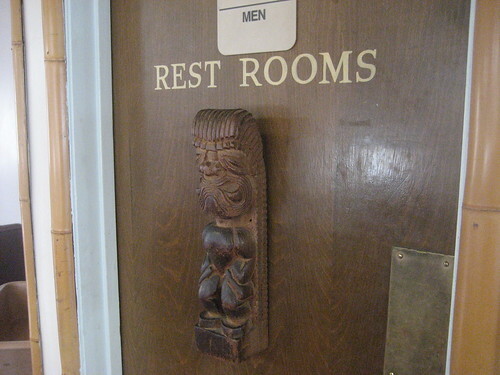 They’re accented with tapa cloth, paddles and tikis that range from Asian imports to large, rough-looking carvings to Oceanic Arts wares. Probably the strangest (or most awesome, depending on your point of view) part of the decor is the arrangement of, uh, interesting wildlife photos. There is no lack of choices on the menu, from pancakes and cream cheese stuffed french toast to huevos rancheros to hamburgers and deli sandwiches. Some of the omelets and frittatas have Hawaiian names like Kahuna and Wahine, but the only island influence in the food seemed to be including linguica (Portuguese sausage) as a filling. 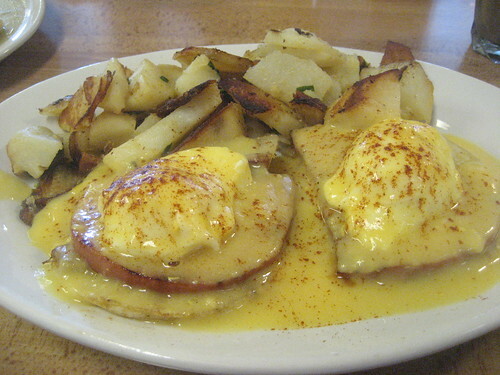 I went for the Beachcomber ($8.25) — their version of eggs Benedict “smothered with our blended cheese sauce,” a description that was deliciously accurate. The “ranch cut potatoes” were a perfect vehicle for soaking up the extra sauce. 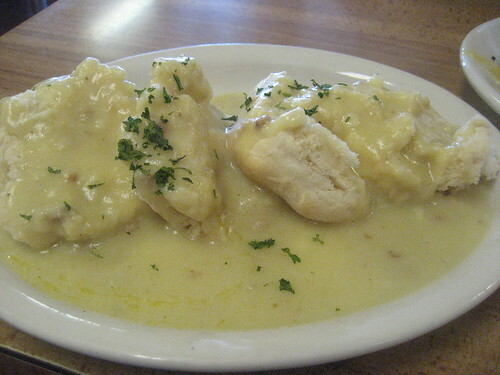 Most of the egg dishes come with their famous biscuits and gravy, but mine did not so we ordered them as a side. I couldn’t help stuffing myself silly with all that tasty salty food. If you’re inspired to take a little detour off the 101, keep in mind this is a breakfast and lunch spot and it’s only open until 2 p.m. Early risers, on the other hand, will appreciate that they open their doors at 6 a.m. every day. 10 Minutes north of my house! 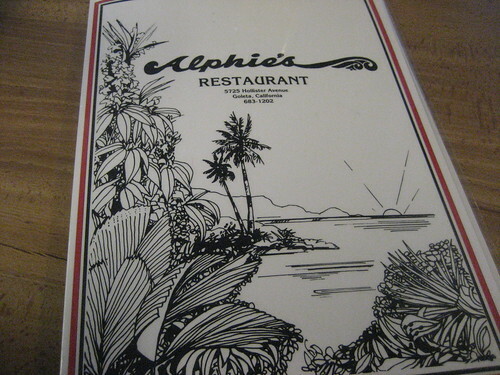 YAY, Alphie’s!!! Nice! Love going up to SB, it’s so beautiful.